Here you can see some of the progress we've made on the overgrowth. Pay no attention to the purple sky in the top photo, I had to get it from the video. 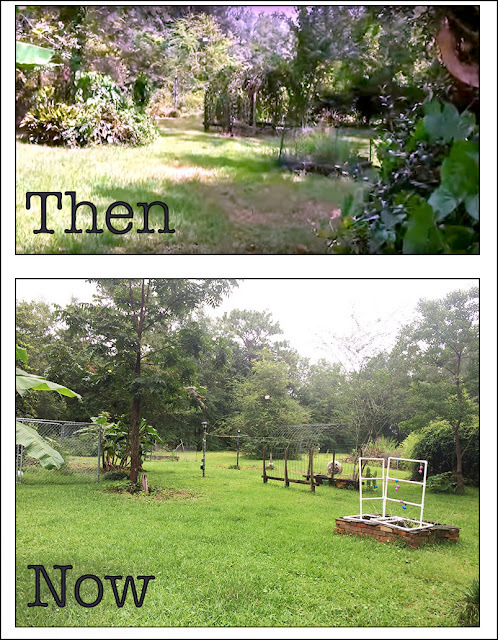 When we bought the place, the property was overrun with jasmine, air potatoes, wisteria, and other invasive plants. You can definitely see that in my initial video tour of the pool and property. 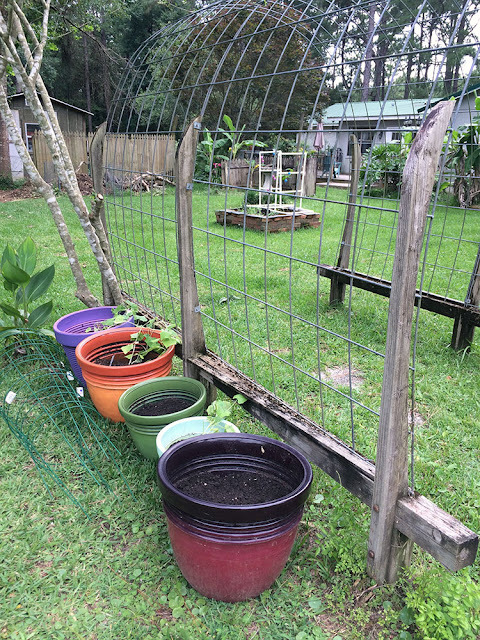 Since we wanted to plant fruits and vegetables, we knew that getting rid of the overgrowth and vines was a priority. After working to clear some areas, we finally started our raised bed garden in November. While the majority of the plants never really did much of anything, there was actually a little success with the salad mix. 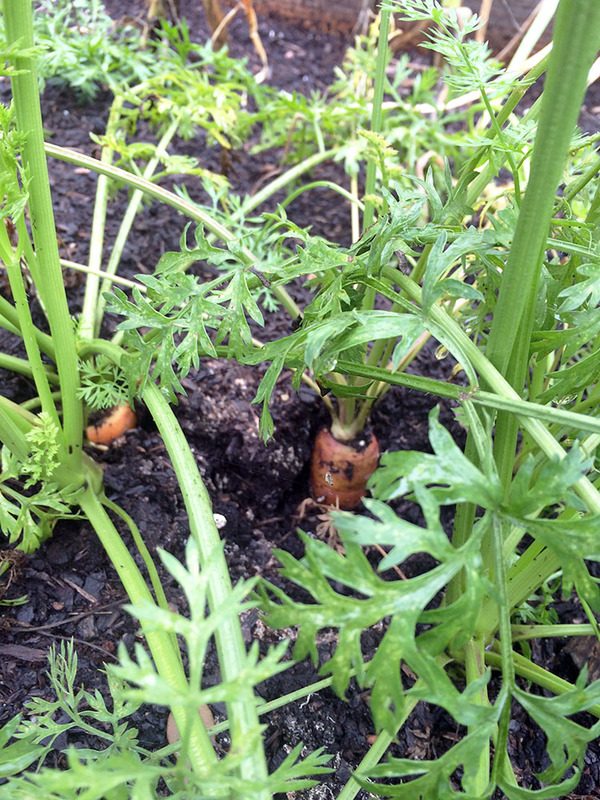 We're still waiting for the carrots, onions, and garlic to ripen. Just about every weekend since it's gotten warm again, we've worked a little more on the property. The past several weekends have been particularly productive. I knew there was some kind of vegetation in the compost pile, but didn't really pay much attention to it until it started blooming. 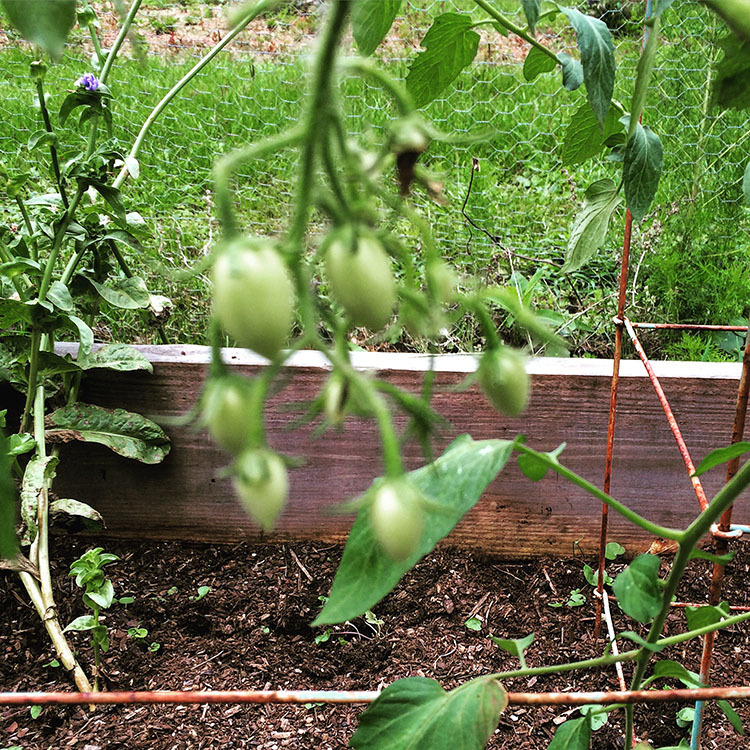 At that point, we realized we had grape tomatoes growing. So, they were transplanted to the raised beds with the hope that they would make it. Five plants were moved, and they seem to be doing well after a few initial days of droop-age. In fact, one of them has several branches of tomatoes already popping out. 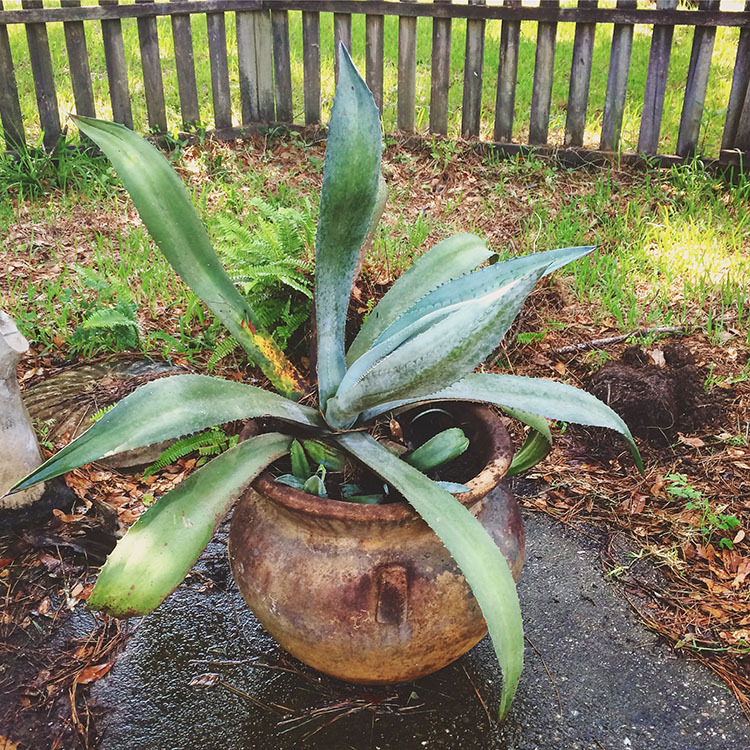 We also transplanted a few agave plants that were left here in plastic containers, dumped over. Fortunately, there were also several nice planters in the pool area. AND, I discovered that the annoying grape vines growing all over the edges of the property will actually bear fruit! So, they can stay for the time being. 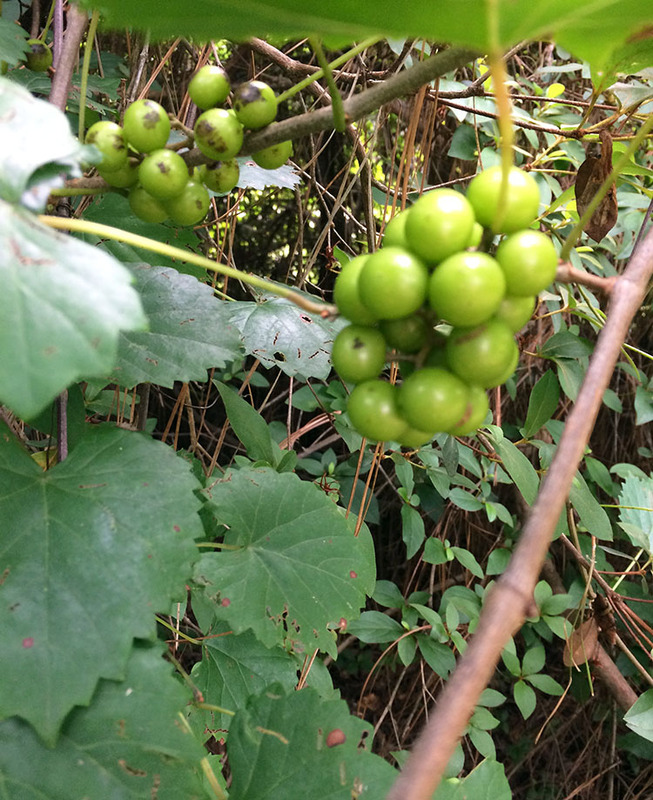 These are muscadine grapes and should ripen sometime in September. After that, we decided to actually pick out and plant the food to we want to grow. So, off to the local feed-n-seed we went. It didn't take long to place what we chose in the dirt. 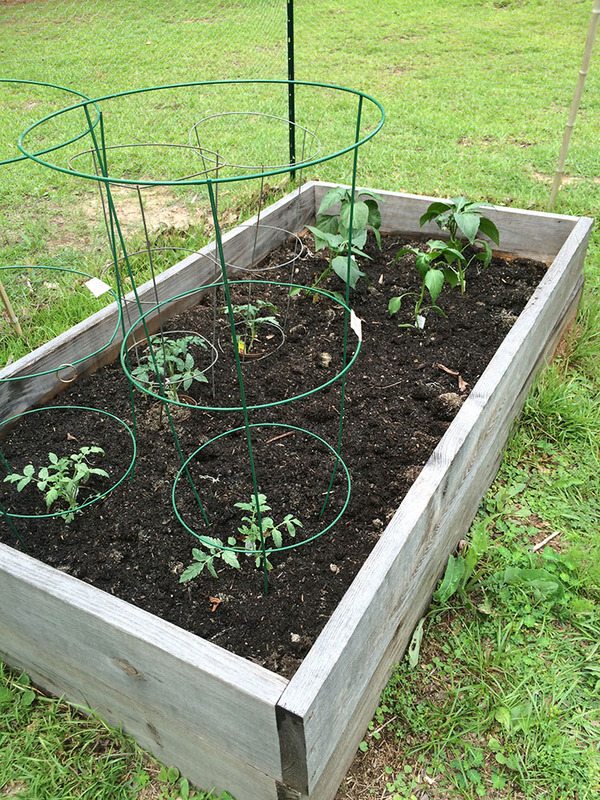 More tomatoes, yellow bell peppers, and jalapenos were put in the last raised bed. 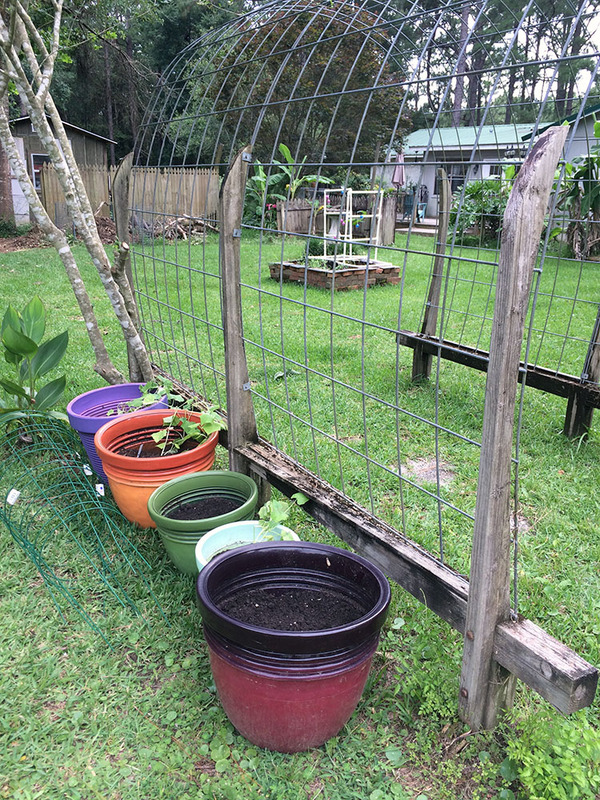 Cucumbers, beans, and zucchini went in pots placed along the trellis. 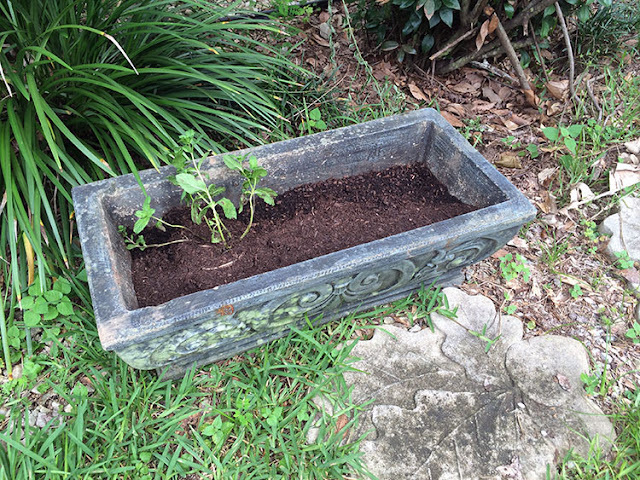 Two found (on property) concrete planters were used to plant an herb garden mix of plants and seeds. I believe I planted basil, cilantro, dill, mint, oregano, and parsley. They're in alphabetical order naturally. I should probably make some plant markers for them before I forget what they are. I also planted sunflower and zinnia seeds in a few locations. You know, to attract the bees. 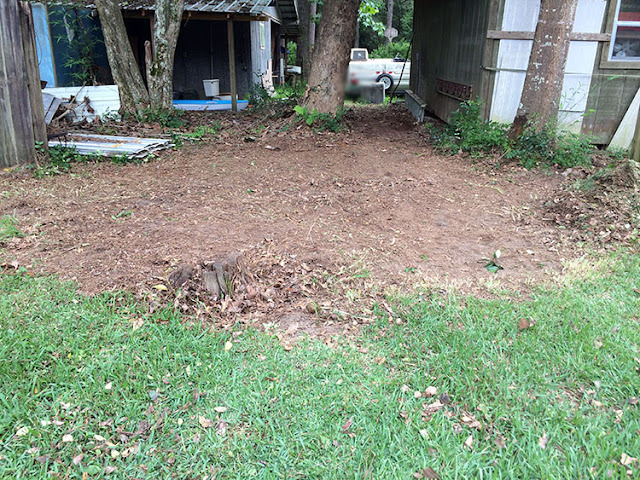 Finally, Pat cleared away another ground-covered area of jasmine and wisteria. Yes, that whole brown area was just vines. It was maddening. Now, we can walk from the backyard to the barn without having to unnecessarily go around several buildings. Yay! We've been plenty productive since we started. I'm happy that we're finally getting it to a more workable point. And, Pat picked up some plastic barrels yesterday so we can start on a rain catchment system to water the garden and the chickens. There's always a project in the works around these parts, but I don't think we'd want it any other way. 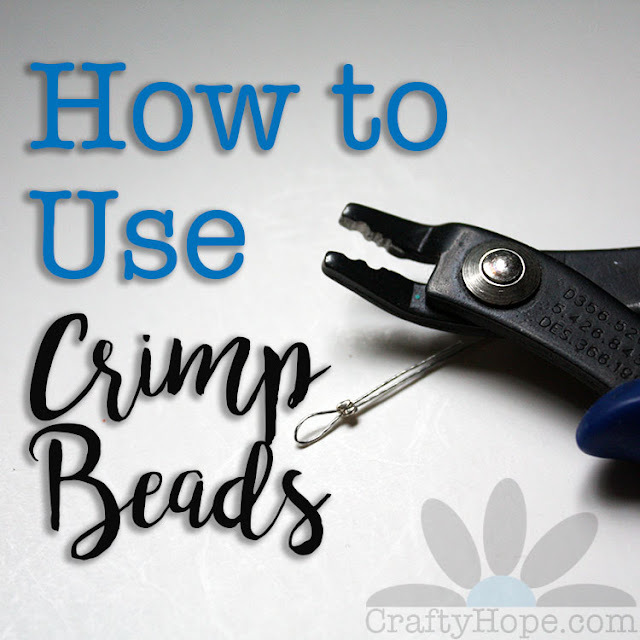 I've linked this up at the Homestead Blog Hop and Simple Homestead Blog Hop. Very productive indeed. It all looks great! I love that concrete planter you found on the property! As for all the vines and invasive plants, did you remove the root systems underground? We have green briar (or cat briar) in our backyard and have pulled up miles of roots (looks kind of like bamboo underground), but we still get little ones popping up because we didn't get all the roots up. It's a never ending battle. Thanks so much! There are all kinds of planters all over the property. Those had ferns in them, as most of the ones around the pool did. But we just dumped them out. As for the root systems. . . we're doing what we can. 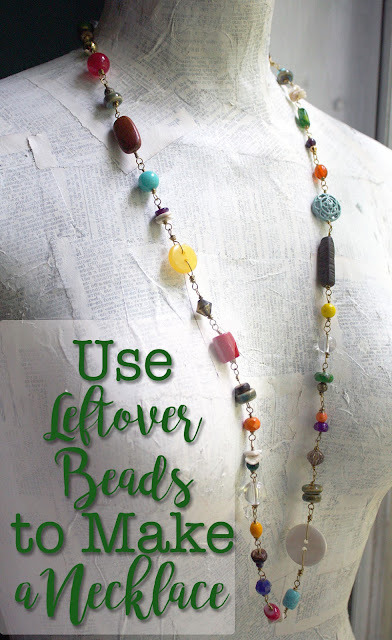 I'm focused on the air potatoes and those can be fairly easy because it's just the buried potatoes that need to come up. However, I seriously believe she (the previous owner) planted them as some of the potatoes are buried more than a foot deep and I just can't get to them. The wisteria is a major problem because of the underground runners. We've cut as many as we can, and Pat swears that as long as he keeps mowing over those areas, it'll eventually stop trying. The jasmine seems to pull up pretty easy. We've done other areas with it without much problem. Again, as long as he keeps mowing there, it's no big deal. We've also got a bunch of blackberry briars that are a problem. But they were buried under all these other vines and couldn't be conquered until we got to these others. Whew. Still so much work ahead of us, but it's good for me to be out there working. I'm getting sore just thinking about all you've done! Yard work is a muscle work out for sure. But it looks like the efforts have paid off. I love all your plants. It's so satisfying seeing everything grow! Happy harvesting! You are creating a great home and beautiful yard. I don't know how you do it all! My husband and I tackled our yard 35 years ago. It was once a half acre of weeks and sandy soil. Now, we have a lush green lawn. We also grew vegetables all while our kids lived here. I love reading about your adventures. I know you enjoy it. If I could do more I would! Sometimes there's just not enough time in a day. Sounds like you know what we're going through here and that your work paid off too!! Thank you so much for the encouragement. It means so very much to me. I'll share more when I can. Sometimes it feels that progress is moving so slow it's not worth sharing. I'm glad there are some out there interested in our little homestead too. Thank you! Apparently, gardening agrees with you :) I even shy away from growing flowers on the balcony, though my friends take care not to leave me without any greenery :) You two have made a lot of improvements on the property, so enjoy the well deserved pool time!